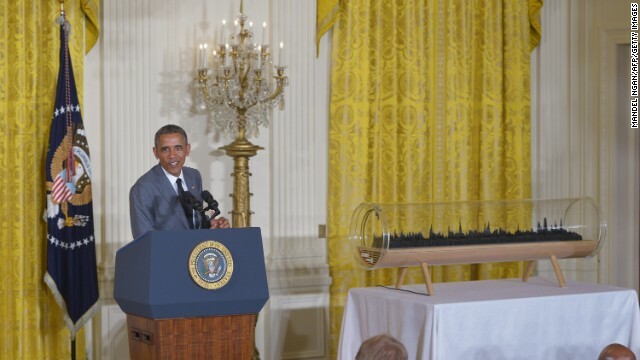 Washington (CNN) – President Barack Obama opened the first 'Maker Faire' at the White House Wednesday, by asking why there was an 'e' at the end of ‘Faire’ He then quipped, “This is America, we don't have 'e's at the end of 'fair'." He then asked jokingly if there would be jousting. With that, the President explained that the fair(e) was designed to help American innovators show off their ideas and inventions and team them up with companies that can help manufacture and market those goods. “Across our country ordinary Americans are inventing incredible things and then they are able to bring them to these fairs like 'Makers Faire' and you never know where this kind of innovation and enthusiasm and creativity could lead.” Obama said. Earlier the President toured those exhibits on the South Lawn and met with their inventors and, according to press pool reports, he viewed electric guitars, a skateboard, a prosthetic foot, slippers, a toy robot, and a large bicycle suitable both for carrying cargo and charging electronics- all fabricated using some or all of the 10 machines inside, including 3D printers and a variety of digital fabrication devices. The President said he's asked Congress to expand programs that would help American innovators, but “In the absence of much action from Congress we are doing what we can. I'm doing what I can on my own to keep that process going so I've launched four new high-tech manufacturing hubs across the country with more on the way.” He said. On Tuesday Obama visited Pittsburgh to tour a TechShop facility that allows would-be inventors to rent out machining equipment like 3d printers, laser cutters, tools and design software on a shared access basis. It also offers classes to would-be inventors. That visit kicked off the ‘Maker Faire’ theme, as the White House announced a collaborative effort with 90 mayors and local leaders from cities and towns across the country who have pledged to provide physical locations to spur local inventions. " If you want to put in some sweat equity you can make it here in America and live out your American dream," the President said at the Pittsburgh event. 0bama reeps with weakness . He want even stop the illegals or terrorist on our own border? Its a good thing for the president to be at the forefront of marketing innovative technolgy around the country and using the white house as the venue. Atleast this will make young americans develope the passion for innovative thinking. All that who support 0bama check out his new inventions it will be available in ALL stores and gas pumps very soon plus s&h . ? Yes im still waiting for my insurance rates to drop Heck i feel so well served and all i think ill hold my breath to i pass out and see if i still got some . Every challenge brings about a new invention some are good some bad ? corporate conservatives: can't we train worker slaves to not get sick?